Despite being the latest version, iOS 12 may cause some problems to your iPhone/ iPad after update. The common problem is iPhone/iPad speaker not working in iOS 12. The frustration you get from this cannot be doubted but the urgent need is to look for practical solutions to immediately fix this issue. On the road to do it, some of you will attribute this problem to hardware faults. However, the most often cause is software flaws, which can hence be rectified. Contained herein are top 5 fixes to iPhone/iPad (iOS 12) speaker not working. Let's look them one by one. As aforementioned, most causes of iPhone /iPad speaker (iOS 12) not working is software related. However, this does not imply that hardware problems may not make iPhone /iPad speaker not to work. One of the versatile fixes to iPhone /iPad (iOS 12) speaker not working is making a call on speaker mode. With the knowledge on the cause, you have an insight on the most suitable solutions to go for. One of the commonest troubleshooting is to check if your iPhone /iPad is in silent mode. If in silent mode, press the toggle button above the volume ones. Furthermore, you should ensure that the volume of your device is set to maximum. You can do this by going to the settings menu, select sounds and the have the volume set to the maximum. Though the above two fixes may seem not sophisticated, avoid overlooking them as we regularly make them. In fact, try these before going for an advanced solution. 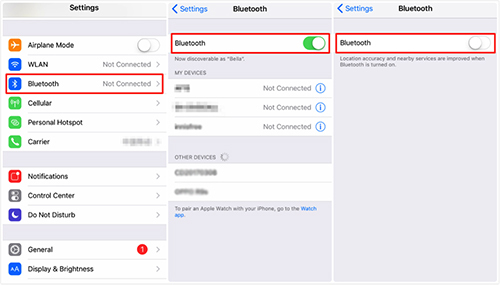 Another mistake that may make iPhone/iPad (iOS 12) speaker not working is connecting the device to an external audio output. Consequently, make sure that the device is not in headset mode. Disconnect any Bluetooth or Airplay audio connection. To turn off Bluetooth connection, navigate to the control panel and switch it off. For Airplay, tap in the app and turn off the connection. Try playing a track and hear if the fixe has worked. You can also increase the volume of the external output device if there is a connection and see if there is an output. As mentioned earlier, iOS 12 not working mainly is software related. After an update or switching on your iPhone /iPad, some software may not load properly and can remain stuck leading to malfunction. A simple way to remedy this is by warm rebooting. Hold onto the sleep button until you are presented with a slider icon on the screen. Drag it and your device will be switched off. Long press the sleep button and turn on your device and see if the speaker works. Rebooting will also fix other issues you were not aware of. iPhone /iPad speaker not working on iOS 12 can be as a result of an advanced software bug. Such problem cannot be fixed by rebooting. The most effective way to deal with such a problem is updating your firmware. Navigate to the settings menu, then click on general. Next, select the software update option. If the software is available, click on the download and install option. However, before download, ensure that you have enough data to finish the download and avoid the embarrassment of a partial download. Or keep backups in advance before clearing up data so that you can use data recovery tool, like Joyoshare iPhone Data Recovery, to recover files in case data loss situations. A speaker not working in your device is normal. Do not panic when the problem occurs. The solutions discussed above are comprehensive and hopefully will help you with the iPhone/iPad speaker not working on iOS 12. If not, there are always specialists who can help you fix the malfunction in professional way.